Bangladesh Police Constable Job Circular 2018 for the post of Trainee Recruit Constable. 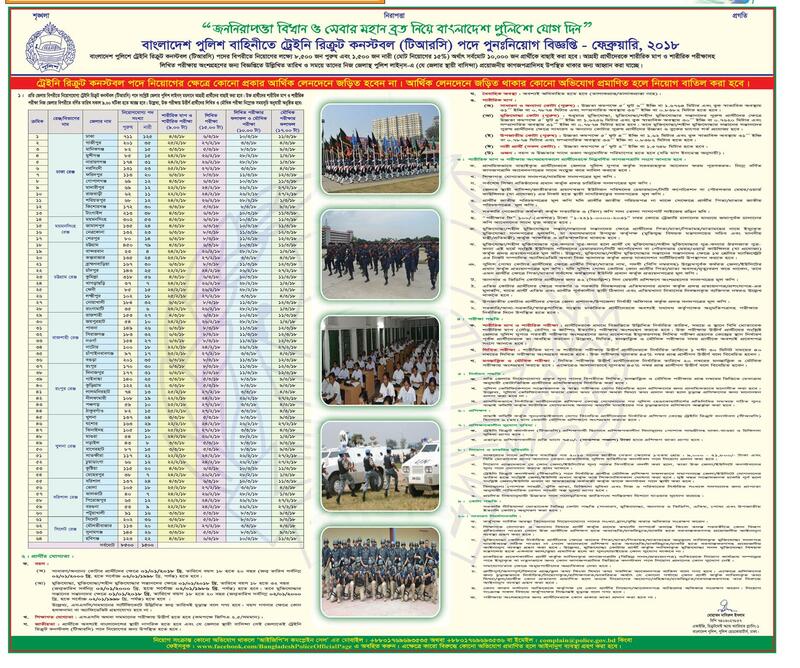 Bangladesh police has published re-recruitment for the post of constable (TRC). Police recruitment notice of 10,000 (ten thousand) vacancies. Both male and female can apply for this job from all over the country. Join Bangladesh Police as a constable to serve the country. Read job description below to know how to apply to the Bangladesh Police Constable Job February 2018. (a) minimum age for general Quota is 18 and maximum age is 20 years. Nationality: Bangladeshi and must be concert district. Height (Female / all quota): Minimum 5′ – 2″ or 1.5748 meter. Weight: According to age and height. First step is to go to concern district for physical test. After successfully passed in this test candidates need to apply given application by police super of that district. All paper needs ti submit along with application form. Please see circular for details. See circular for physical test schedule, place of your own district. Stay with us for all kind of information about Bangladesh Police Trainee Recruit Constable job circular of February 2018.